There has always been some sort of rebellion against normal living as if it is some kind of curse. A nice house, a couple of decent cars and a house full of kids is the best life anyone could hope for and yet some look at a normal life as if it is a prison. One of the ways to rebel against the normal life in modern times is the tiny house and cargo box crazes that have taken America by storm. Tiny houses are adorable little cottages that are often built on wheels so they can be easily transported. These aren’t just simply over-glorified trailers. Often they are quite elaborate with tiny kitchens and tiny water closets. For a weekend outing, these little houses are a perfect alternative to a Winnebago or converted school bus which requires a large area for storage and regular mechanical maintenance and is certainly a lot nicer than most campers you might pull behind your car. The problem is people are taking up residence in these doll houses. A tiny house isn’t a house it is something you build in the backyard for your wide-eyed elementary school age daughter. The only real difference is that building a tiny house can cost as much as a brand new car, truck or van. You can live about as well in a van and at least the van will get you to work and back. Think about how inconvenient it is to live in a tiny house. If you think there will ever be a time when you can stand in a hot shower for 20 minutes you can forget it. You can also expect to dispose of your own human waste every single day which just sounds like a barrel of fun. 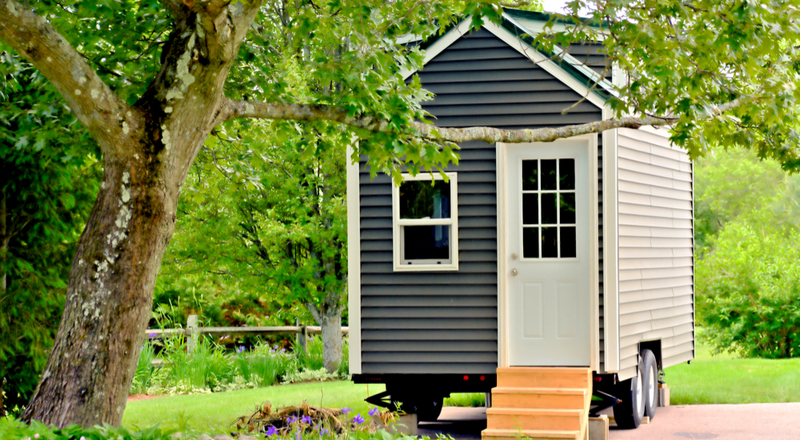 How many towels and clothes and shoes do you think fit into a tiny home? Many of these tiny homes are occupied by couples so cut that number in half. Then there is the smell. You probably won’t be washing your clothes every single day and in a tiny space stinky clothes might be noticeable. Add to that smell anything you’ve cooked, shoes, normal body odors (no sweating in the house please) and whatever domesticated pet you might have and a tiny home can get stinky pretty fast. You might get accustomed to the smell and actually not even notice it after a while but anyone visiting you will notice it and you’ll bring that stench everywhere you go. If you’ve ever stood next to someone in a store who worked all day outside you know smells travel. What if while you are moving your tiny house you blow a tire at 60 mph? Suddenly you’re homeless. Boom just like that. Worse, that blown tire might cause serious damage to your car if the trailer goes out of control and then not only are you homeless but you don’t have any transportation. That would be 10 to 30 thousand dollars gone on the little house alone even before your vehicles possible damages. I can’t imagine that full coverage insurance on a tiny mobile house would be cheap either. There are also people who build houses out of those huge metal shipping containers you see on large cargo ships. Building a house out of a shipping container is not cheap. Sure it might be fun to build and thinking out of the box while at the same time using a box is a pretty cool concept. Somehow the reality of living in a shipping container for several years seems kind of depressing. After all, it is just a box. Take a close look at a Victorian styled home sometime. It is also just a box with a silo, large porch and shutters. Which box would you really rather pull up to each day when you get home from work? These new styles of homes is pretty much paying a lot of money to live like a homeless person. Living in backyard princess sheds and shipping containers is what people who drink MD 2020 do. For normal people with normal jobs and lives, these home are a potential disaster. Try selling a used cargo box house. Look if you want a camper and don’t want to spend $100,000 buy a used school bus. They are cheap (6-10k used), easy to drive, easy to convert, easy to work on and get parts for, and if you keep the outside of it looking like a school bus you can park them almost anywhere and they have tons of windows to keep the stink under control. But if you just have to build a tiny house then find a good woman, settle down, have a daughter and build one for her in the back yard of your normal house. Or you can always just give up on life, become homeless, and find a shipping container (or railway car) you can sleep in for free.